Ipomoea staphylina plant ethanolic extract was subjected to preliminary qualitative phytochemical and quantitative GC-MS analysis with analyzing its antibacterial activity by the standard method. The preliminary qualitative phytochemical analysis is done by standard procedure and quantitative GCMS analysis is done by subjecting it to GC Model: Thermo Trace GC Ultra model instrument. Antibacterial activity is done by the standard agar well diffusion method. Preliminary qualitative phytochemical analysis for pet ether and chloroform extract confirms for fewer phytochemicals but ethanolic extract confirms for the presence of alkaloids, saponins, flavonoids, steroids, glycosides, phenols and sterols. GC-MS analysis of I. staphylina ethanolic leaf extract confirms the presence of 79 compounds, out of these 24 compounds were unknown and 55 compounds were known for its medicinal properties. The antibacterial experiment revealed that I. staphylina plant ethanolic extract has appreciable antibacterial activity in all tested concentrations against selected bacterial pathogens but comparably less with the standard ciprofloxacin used but pet ether and chloroform extract showed negligible antibacterial activity. I. staphylina plant could be exploited as a valuable source of antibacterial agent enriching with known antibacterial compounds. Fig. : Ipomoea staphylina Roem & Schult. 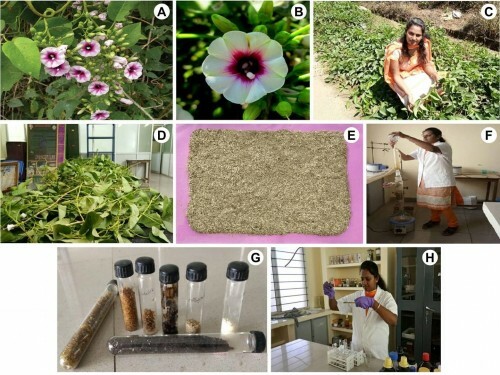 : A, Plant habit; B, Plant flower; C, Collection of plant material; D, Shade drying of the plant sample; E, Plant sample grinded; F, Soxhlet extraction with different solvents; G, Extracts collected in glass container; H, Priliminary phytochemical analysis of plant extracts.